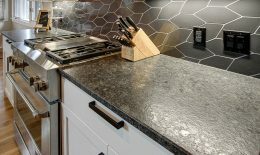 Quartzite - Granite Source Inc. 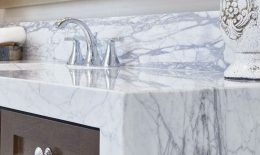 The look of marble with the durability of quartz. 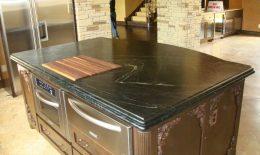 Quartzite countertops are an incredible addition to your home kitchen remodel. 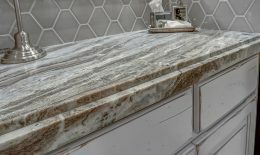 If you like marble, you’ll love quartzite. 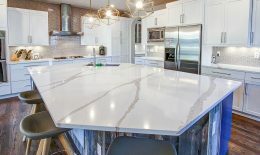 It has the look of marble, but it’s much easier to care for, so if maintenance is an issue that keeps you from marble, this is a great alternative. Quartzite is usually white or light-colored because quartz sand is light colored. Additional minerals carried by groundwater can impart hues of green, blue, or ion-red. Quartzite is metamorphic rock formed from sandstone. Quartzite begins its geologic life as sand grains, perhaps on a beach, desert dune, or riverbed. Over time, the sand grains become compressed and stuck together to form sandstone. If the sandstone gets buried ever more deeply underneath layers of rocks, it gets hotter and more compressed. With enough heat and pressure, the sand grains lose their original shape and fuse to their neighbors, forming a dense, durable rock. 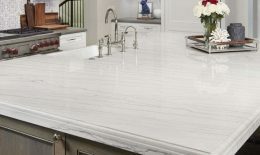 Regular, daily care of your quartzite counters should include cleaning up spills immediately (even sealed countertops can stain if the sealant has worn thin). Also, wipe them down with a damp rag and a drop of pH balanced dish soap. This will keep them clean without damaging the finish. Classic and contemporary looks for your home or business. Diverse color selection and resilient wear. An opulent and graceful choice. Endless uses with unmatched durability and resilience. Choose the perfect detail to finish your design.